Want your physique and upper-body to stand out? This program is designed to develop your chest, back, delts and arms. It allows you to train upper-body 2-3 times a week in all the different rep ranges and get stronger over time (if you use "progressive overload"), something that is required to build muscle. Combine with the "Grow your legs!" 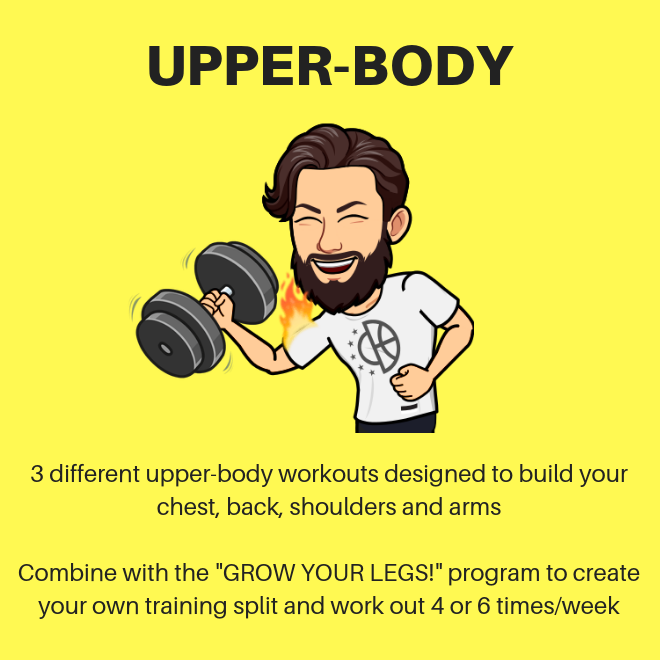 program to create your own upper/lower body split and work out 4 or 6 times/week depending on your level and experience! All of my programs are based on the latest research to help you take your physique to the next level. Note: No ab exercises included in this program. You are responsible for being in good enough condition to complete this program without risking any serious injuries. I am NOT responsible for any injuries you might get while doing this program.